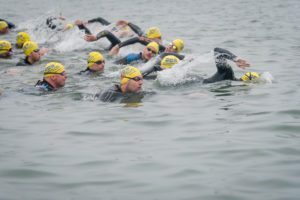 There were some wild swim conditions at Ironman events over the weekend (April 6-7, 2019). Ironman 70.3 Oceanside was moved to an ocean start this year, and swimmers had to go out through some pretty big waves. At Ironman South Africa (African Championship) they had to cut the swim short because of rough surf. I was at Oceanside and I saw dozens of people struggle to get through the waves, and many people had to be towed back to shore by lifeguards. Mikael Staer Nathan is a Canadian pro who had a great swim at Oceanside, and he explains how to get under the waves to have your best swim if you’re faced with these conditions.